Will Santa Leave a Lump of Coal? It was a bumpy sleigh ride last month, but we ultimately entered December in a festive mood with joyful monthly gains of +1.7% in the Dow Jones Industrial Average, and +1.8% in the S&P 500. There have been some naughty and nice factors leading to some turbulent but modest gains in 2018. For the first 11 months of the year, the Dow has rejoiced with a +3.3% advance, and the S&P 500 has celebrated a rise of +3.2% – and these results exclude additional dividends of approximately 2%. Despite the monthly gains, not everything has been sugar plums. President Trump has been repeatedly sparring with the Federal Reserve Chairman, Jerome Powell, treating him more like the Grinch due to his stingy interest rate increases than Santa. As stockholders have contemplated the future path of interest rates, the major stock indexes temporarily slipped into negative territory for the year, until Mr. Powell gave stock and bond investors an early Christmas present last week by signaling interest rates are “just below” the nebulous neutral target. The dovish comment implied we are closer to the end of the economy-slowing rate-hike cycle than we are to the beginning. Trade has also contributed to the recent spike in stock market volatility, despite the fresh establishment of the trade agreement reached between the U.S., Mexico, and Canada (USMCA – U.S.-Mexico-Canada Agreement), a.k.a., NAFTA 2.0. Despite the positive progress with our Mexican and Canadian neighbors, uncertainty surrounding our country’s trade relations with China has been challenging due to multiple factors including, Chinese theft of American intellectual property, cyber-attacks, forced technology transfer, agricultural trade, and other crucial issues. Fortunately, optimism for a substantive agreement between the world’s two super-powers advanced this weekend at the summit of the Group of 20 nations in Argentina, when a truce was reached to delay an additional $200 billion in tariffs for 90 days, while the two countries further negotiate in an attempt to finalize a comprehensive trade pact. 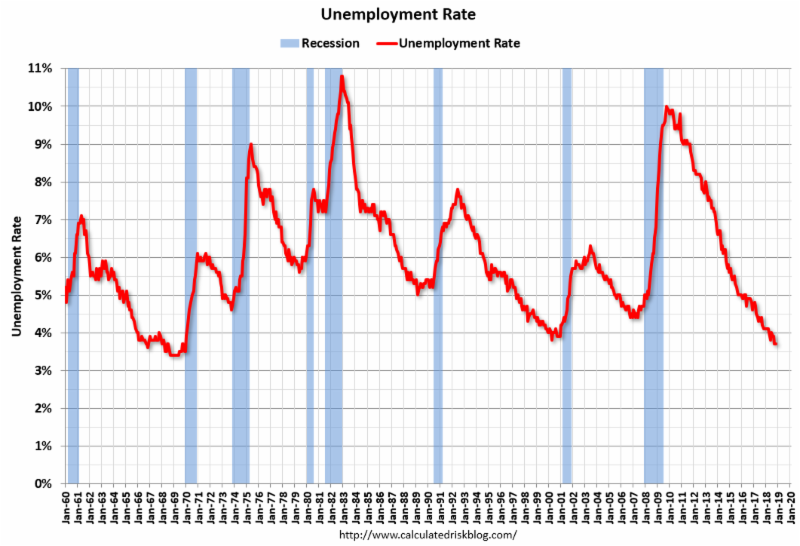 Low Unemployment: The economy keeps adding jobs at a healthy clip with the unemployment rate reaching a 48-year low of 3.7%. Rising Consumer Confidence: Although there was a slight downtick in the November Consumer Confidence reading, you can see the rising long-term, 10-year trend has been on a clear upward trajectory. Solid Economic Growth: As the chart below indicates, the last two quarters of economic growth, measured by GDP (Gross Domestic Product), have been running at multi-year highs. Forecasts for the 4th quarter currently stand at a respectable mid-2% range. Although the majority of economic data may have observers presently singing “Joy to the World,” the uncertain political weather forecast could require Rudolph’s red-nose assistance to navigate the foggy climate. The mid-term elections have created a split Congress with the Republicans holding a majority in the Senate, and the Democrats gaining control of the House of Representatives. As we learned in the last presidential term, gridlock is not necessarily a bad thing (see also, Who Said Gridlock is Bad?). For instance, a lack of government control can place more power in the hands of the private sector. Political ambiguity also surrounds the timing and outcome of Robert Mueller’s Special Counsel investigation into potential Russian interference and collusion, however as I have continually reminded followers, there are more important factors than politics as it relates to the performance of the stock market (see also, Markets Fly as Media Noise Goes By). 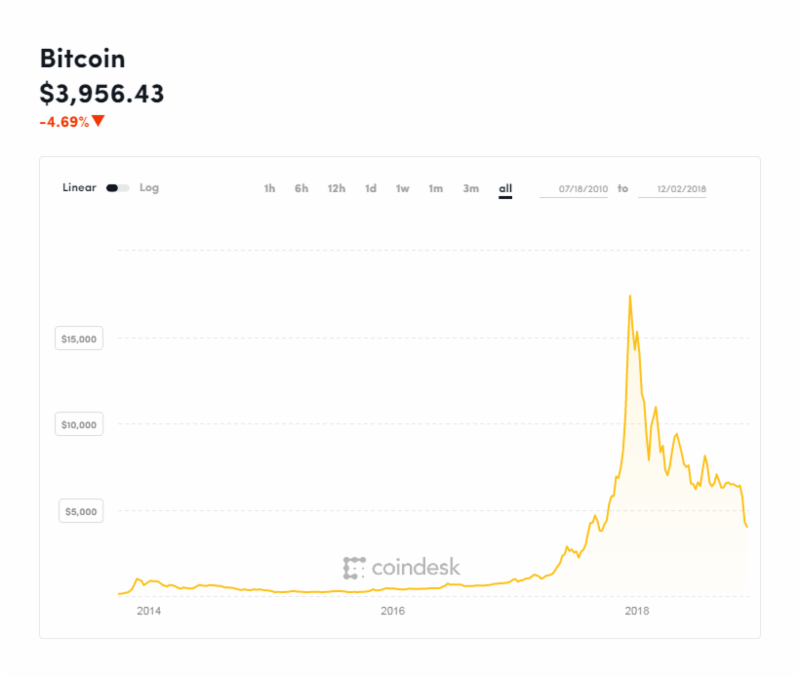 From an economic standpoint, some speculative areas have been pricked – for example the decline in FAANG stocks or the burst of the Bitcoin bubble as the price has declined from roughly $19,000 from its peak to roughly $4000 today (see chart below). On the housing front, unit sales of new and existing homes have not been immune to the rising interest rate policies of the Federal Reserve. 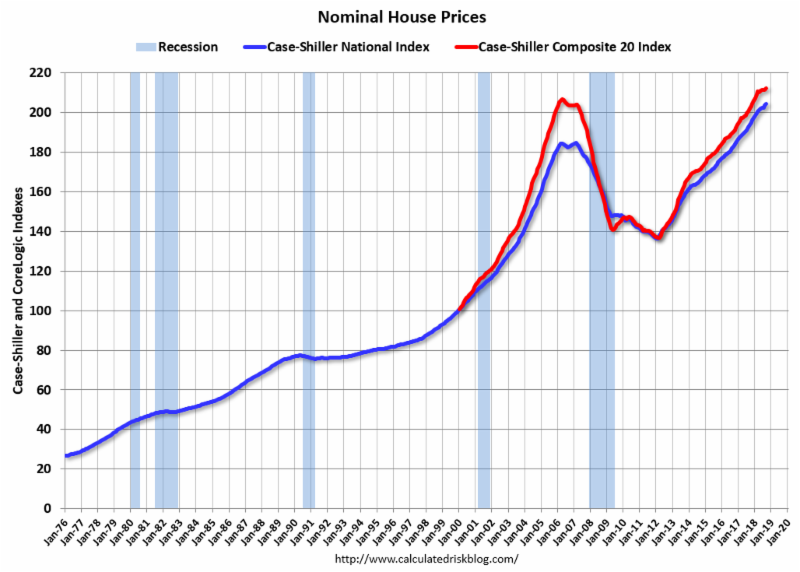 Nevertheless, as you can witness below, housing prices remain at all-time record high prices, according to the recent Case-Shiller data. I like to point out to my investors there is never a shortage of things to worry about. Even when the economy is Jingle Bell Rocking, the issues of inflation and Fed policy inevitably begin to creep into investor psyches. While prognosticators and talking heads will continue trying to forecast whether Santa Claus will place presents or coal into investors’ stockings this season, at Sidoxia we understand predictions are a fool’s errand. 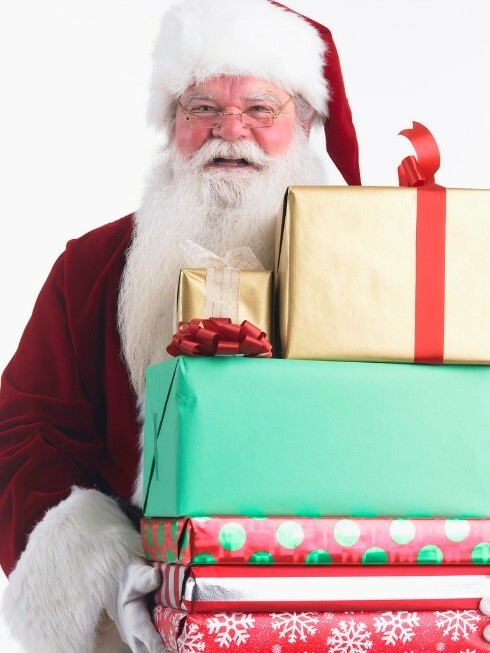 Regardless of Santa’s generosity (or lack thereof), we continue to find attractive opportunities for our investors, as we look to balance the risk and rewards presented to us during both stable and volatile periods. DISCLOSURE: Sidoxia Capital Management (SCM) and some of its clients hold positions and certain exchange traded funds (ETFs), but at the time of publishing had no direct position in any other security referenced in this article. No information accessed through the Investing Caffeine (IC) website constitutes investment, financial, legal, tax or other advice nor is to be relied on in making an investment or other decision. Please read disclosure language on IC Contact page. This entry was posted on Monday, December 3rd, 2018 at 9:12 pm and is filed under Appears on main page, Immediately available to public, Phil's Favorites. You can leave a response, or trackback from your own site.